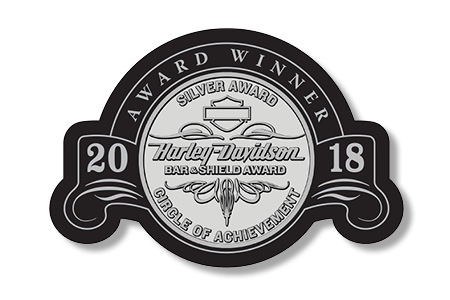 Harley-Davidson® of Nassau County earned the prestigious Silver Bar & Shield Circle of Achievement Award for 2018. Presented by Harley-Davidson Motor Company, this award is given to dealers based on motorcycle and related product sales performance, customer service and satisfaction, and operational measures. Silver Bar & Shield Award recipients, like Harley-Davidson of Nassau County, consistently elevate the brand by providing their customers with exceptional and authentic Harley-Davidson experiences. "It's something we strive for," Larry Altholtz says. "We don't change our business practices around these measures," he said. "They really are Best Practices, and everyone at our dealership rises to meet, or to surpass them. This is Harley-Davidson of Nassau County's sixth Bar & Shield Award, following the Gold Circle of Excellence Award for 2012, the Silver Circle of Achievement Award for 2015 and the Bronze Circle of Recognition Awards for 2014, 2016 and 2017.